about the Long Island Ducks' Kids Club President! That's right; QuackerJack has let us in on some of a duck's favorite things! Want to know QuackerJack's birthday? QJ's birthday is celebrated every year on March 18th! Long Island's largest living duck has a nickname too. 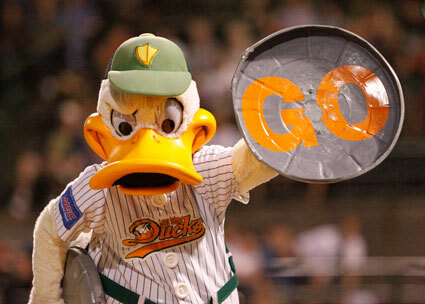 You got it; around the ballpark you'll hear all our fans calling QuackerJack by the nickname "QJ." I bet you knew too, that QJ loves to play baseball. Yes -- QJ throws both right and left, and bats both right and left. WOW, that's some DUCK!! In case you couldn't tell by his size, QJ enjoys food too. Anything that isn't fowl that is, and oh yeah, he LOVES duck sauce. I bet you didn't know this - QJ has a favorite movie! That's right, when he isn't dancing on the "Duck-out" or racing a kid around the bases, QJ will sit back and watch his favorite movie, "Howard the Duck." We've been told that QJ grew up with his own "duckling" hero. Just like the rest of us, QJ looked up to someone. QJ's hero is The San Diego Chicken! Ever wonder who QJ's favorite ballplayers are? Well of course they are Buddy Harrelson and Goose Gossage! Hey Kids, did you ever play the game Duck, Duck, Goose? Well guess what, that's QJ's favorite game. Although you may not see QJ soaring through the ballpark, QJ's favorite song just happens to be "I Believe I Can Fly." 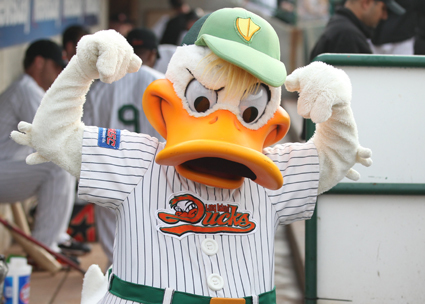 In case you didn't know it, QuackerJack loves the chance to meet and greet all the friends and fans of the Long Island Ducks. QJ is available for a wide range of functions within the Long Island community.